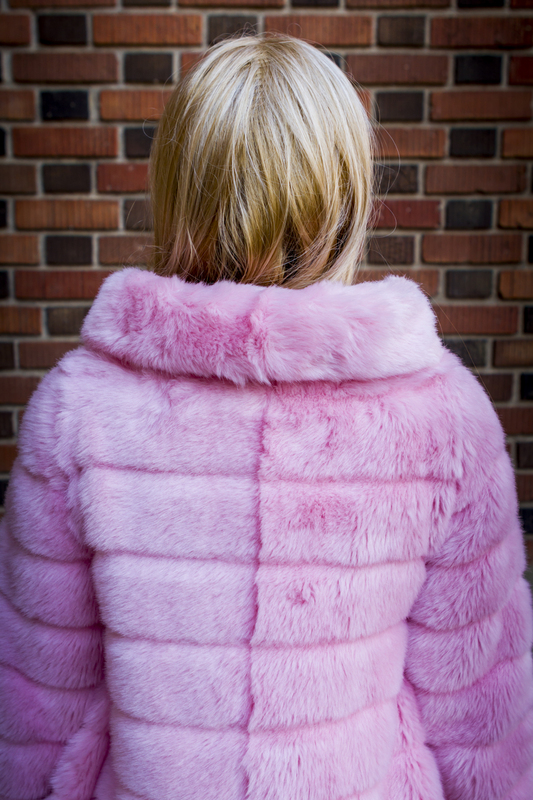 I made a cotton candy coloured furry pink coat! Quite possibly my favourite coat that I've made yet. I'm super excited about it! And yes, it is indeed for sale! I'll have a handful of these available at the Vixens of Vintage Market in Edmonton on November 21st and 22nd! 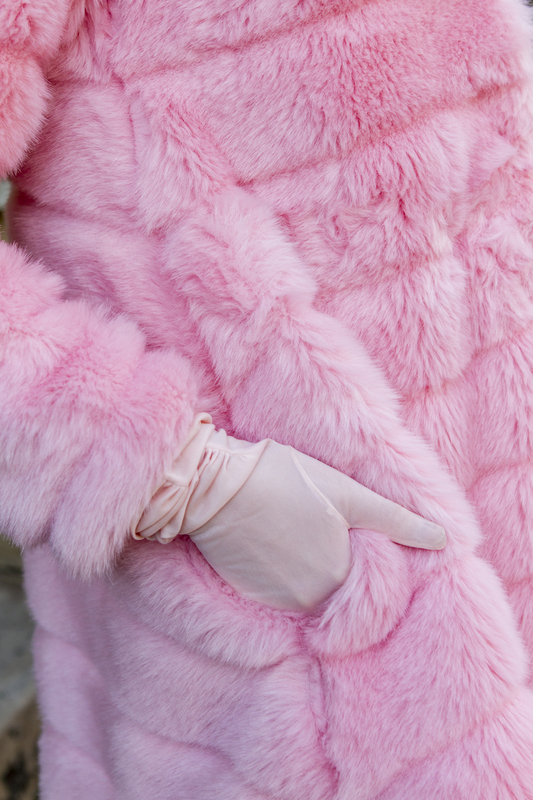 The inspiration for my cotton candy coat is from the movie called "What A Way To Go". Oddly enough, I've never actually seen this movie. It's high on my to-do list but I just haven't been able to catch it. (I'm inept at downloading movies in case you're wondering.) But, just because I haven't seen the movie yet that doesn't mean I didn't completely fall in love with the costuming when I first saw it. My senses were just bursting. The cape! The hair! The car! What movie is this? WHO is this? How do I do my hair like that? The thing about inspiration is that you never know when it will strike. I've loved the images of Shirley in her pink glory for ages and had zero intention of paying homage to it. I was on a fabric store run a few weeks ago in search of melton wool to make some fall coats but after perusing the wool aisle I just didn't see a colour that I LOVED. And I can't make something if I don't absolutely love the fabric. With no luck in the wool aisle, I went to the oddly large selection of faux fur. Seriously. E-town must love its faux fur cause my usual fabric store has a TON of it. As soon as I saw this chinchilla-esque fabric I immediately thought of Shirley! The wheels started turning and I hauled a roll of fabric the size of me back to my in home sewing "studio". I use the term studio loosely because what it really is, is a drafting table and sewing table crammed into the back half of my one bedroom apartment. Naturally, I wasn't out to copy Edith Head's gorgeous handy work. I had to put my own spin on it. I've always liked tent coats and the fluffy fabric just seemed like it would be so cozy in voluminous proportions. And of course the faux fur isn't quite as chinchilla-y as the stuff used by Edith Head. And I'm ok with that! Being an animal loving veggie head, I have a hard time with the use of fur as fashion. Faux fur is great because it draws inspiration from nature but no cute little critters are skinned to make it. Ruby also approves of faux fur! I'm so, so happy with how this coat turned out. I love it and I hope you do too! As mentioned previously, you can catch me selling some of these pretty coats and a few other 1960s inspired goodies at theVixens of Vintage Market at the Prince of Wales Armoury in Edmonton this November. Thanks for looking and I do hope to see you there! !